Before the rise of the silicon chip and the resulting explosion of games consoles and computer games, kids around the globe were interacting with toys that were designed to stimulate their imaginations and in some cases even burn off a few calories in the process. The golden age of toys spans almost three decades from the early sixties to the late eighties, toys which are fondly remembered by parents and grandparents alike, Space Hoppers, Slinky’s, Clackers and Weebles to name just a few. Well the good news is many of these toys are still manufactured today and readily available from on-line superstores such as Amazon. Hopefully this article will bring back fond memories and give you some great gift ideas for the children in your life and who knows they might actually be encouraged to turn off that console and have some good old fashioned fun. Introduced to the United Kingdom in 1969 the space hopper with its stupid face and big ears which doubled as handles, was basically a giant inflatable ball which you sat on and well, bounced up and down, not the best form of transport I must admit but guaranteed to make you look ridiculous as you bounced around like a demented kangaroo. The only good thing I can say about this crazy orange blob with the funny face, is it was the most amazing fun experience ever and you never saw many obese kids in the late sixties, why? Bounce around on this for five minutes and you will soon find out, a guaranteed calorie burner. 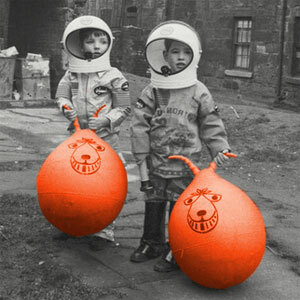 Amazon not only stocks the original orange space hopper but has also added a few new fun alternatives into the mix. A simple concept which was infuriatingly difficult to master. Clackers took the world by storm in the late sixties and the craze lasted well into the early seventies. The idea was that you got two plastic balls suspended on a piece of string to continuously bounce off each other and create the most incredible clacking noise ever heard. However this took loads of practise, I remember looking on enviously at my school-friends who had mastered the technique but who in turn laughed loudly at my feeble attempts. That is until one day it all clicked into place, or should that be ‘clacked’ into place? I am not sure how it happened but all of a sudden I had mastered the Clacker’s, flushed with success and with a true sense of achievement I was clacking with the best of them. This amazing toy will surely make a comeback some day and once again the universe will be filled with the sound of happy clackers everywhere. Beat the rush and get yours today, can you still do it? Impress the kids with your expertise and laugh cruelly at their feeble attempts, they can destroy you at C.O.D but you are a Clacker Jedi, enjoy. Mousetrap the game, was first introduced to the world by the Ideal Game Company in 1963 and soon became a firm favourite among children and parents alike. Fiddly to set up but that’s half the fun, kids will enjoy building it as much as they enjoy playing it, great fun for all the family. The very first Weeble was born on the 23rd of July, 1971 and emerged from the ‘womb’ of Hasbro’s Playskool division. “Weebles wobble, but they don’t fall down” was probably one of the most remembered catchphrases of all time, so popular that when the toy was relaunched in the early noughties and again in 2010 the toy and catchphrase became inseparable. Nowadays there are a plethora of Weebles and Weeble playsets to choose from including the classic Haunted House and the popular Playskool Weebles Tree House, as well as the more modern incarnations such as the Peppa Pig Weebles. With a history spreading over the last forty years Weebles have also become very collectable, so much so that there is even a Price Guide and Index Book which lists every Weeble and playset ever made. No page about old fashioned toys would be complete without mentioning the Slinky, a simple idea involving a stretchy helical spring, that keeps kids and grown up’s mesmerised and entertained for hours on end. Invented by naval engineer Richard James in the early 1940’s, the toy became an unprecedented success and has spawned various incarnations over the years, such as Suzie the Slinky Worm and the Slinky Dog, who went on to become a Hollywood superstar following a cameo role in the hugely successful Toy Story Movie. Amazingly still on sale after almost seventy years of production, well they do say that the simplest ideas are the best. What is the best selling Christmas Toy of all Time? PreviousWhat is the best selling Christmas Toy of all Time?